A crippling knee injury forced Elliot Mills to trade in his FBI badge for dusty chalkboards and bored college students. Now a history professor at Puget Sound university, the former agent has put his old life behind him—but it seems his old life isn’t finished with him. Well, that left a bad taste in my mouth. Elliot, the protagonist calls a black woman racist, twice. Apparently it’s a two way street and you can’t call someone a racist without being one yourself. Especially if you’re black, and a woman. Speaking of the women, none of them are shown in a positive light: Dad’s family friend is a possible cheater, Elliot’s boss is a no-nonsense strong woman so of course she’s overbearing, a student is either a airhead or a hapless seducer, and of course the racist aunt of a missing student. Without Elliot’s misogynistic attitude for women the slow burn reconnection with his ex-lover-slash-coworker was pretty well done. There was a problem with miscommunication or lack of communication. The murder mystery was as well done as can be expected from a Lanyon, which is to say it’s predictable only if you pay attention to it. I’ve learned not to. 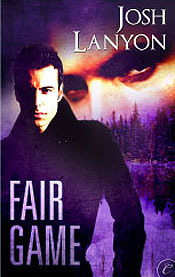 This entry was posted in book review, contemporary, crime, lgbtq, read in 2015, romance and tagged Fair Game, Josh Lanyon. Bookmark the permalink. Why some of those gay romance writers feel the need to bash women? As if they didn’t know how it feels to be prejudiced against. Not all is fair it seems, even for somebody as good in their trade as Lanyon. I agree with Portiabridget…..why bash women? It’s silly.